“I feel like we have won the lotto”, said David Murphy, Chairperson, Citywest Educate Together Second Level Campaign Group, today following the Department for Education’s ‘Schools Allocation Announcement 2019-2022’. A 1,000 pupil school will open it’s doors in Citywest/Saggart in September 2020. Citywest Educate Together Second Level Campaign Group has been actively campaigning for a second level school in Citywest/Saggart for over 4 years working with all local councillors and TD’s from all sides of the political spectrum to ensure the allocation of a much needed second level school for the area. Following a meeting in early March between Citywest Educate Together Second Level Campaign Group and local TD’s & councillor’s, a ‘topical issue’ was raised in Dáil Eireann on March 27th by 5 TD’s, Paul Murphy (AAA-PBP), Eoin O’Brion (SF), John Lahartt (FF), Colm Brophy (FG) and John Curran (FF). The pressure from this and the work of Minister Katherine Zappone have helped make today’s announcement possible. There has been a dire need for a Second Level in Citywest/Saggart, for over a decade. Saggart is the fastest growing town in Ireland and 524 new homes have been approved for Fortunestown Lane/Garter Lane, on Wednesday 12th April. Presently there are no second level schools to cater for the 4 national primary schools in Citywest/Saggart. The announcement for a second level school today means children can continue their education with their friends following their 8 years at primary. With 5 ASD Classes between St. Mary's National School and Citywest Educate Together National School; having a second level school in the area will make the transition easier for those students with special needs and reduce unneeded stress on them and their families. Building this Second Level School in Citywest/Saggart will also mean less burden on already over-subscribed second level schools outside Citywest/Saggart in Rathcoole, Tallaght and beyond. The announcement of this 1,000 pupil second level school will allow children to walk to school reducing numbers on the already over congested roads and will also create a community focal point for Citywest/Saggart. This announced today gives Citywest/Saggart the infrastructural piece it has been missing for nearly 20 years. The 1,000 pupil second level school announced today for Citywest/Saggart is expected to open in 2020. Hey Minister! Where is our Second Level School? A big thanks to all the parents and children who braved the chilly weather to gather for the above photo op for The Echo Newspaper, just before Christmas, at the SDCC proposed site location for a second level school opposite TLC Nursing Home in Citywest. I am writing to you in response to your excellent article in The Echo on December 1 about a letter sent to the Dept. of Education by councillor Martina Genockey requesting attention on the urgent need for a secondary school in the Saggart/Citywest area. I am an activist and parent with Citywest Educate Together Secondary School Campaign. We have been campaigning since 2014 for an Educate Together secondary school in our community to follow the wonderful education our children have been afforded in Citywest Educate Together National School. Frankly, we thought we’d plenty of time, but now it seems the Dept. of Education is ignoring the need for secondary schools in our area despite setting up four primary schools. I was one of the original campaigners for the start up group for this school, and The Echo was also a great supporter of this campaign. In no small way did The Echo help our campaign to gain public attention. And look at our primary school now. It is thriving and has exceeded my biggest dreams for my children’s primary school, and it gives the area a choice of education. So far, our secondary school campaign has yielded results – we successfully worked with local councillors when we started, to make provision for a second-level school in the local area plans for Citywest. Most people think we’re a fairly new area, but I’ve lived in Citywest for 18 years and we’ve been exporting our teenagers to other communities for second-level education for even longer than that. With a population explosion in the area, and even more houses being built, it seems insanely poor planning to make provision for four completely full primary schools and no secondary school for miles. Our first class in Citywest Educate Together National School graduates in 2019 and needs a secondary school that year. Are we to see this first Educate Together class split up and take up places in other community’s schools? We want them to stay together and stay in their own community, causing less congestion on the roads and less congestion in other schools. What Dublin public school doesn’t have an overcrowding or oversubscribed issue? Over 1,900 children will attend four national schools in our area in the next three years – it seems unfathomable that the Dept of Education has made no provision for secondary education for all these Citywest and Saggart children. The South Dublin County Council has provided for a secondary school in their plans for Citywest, so what is the Dept. Of Education waiting for? The need for a secondary school becomes urgent for our primary school attenders in 2019, and we would like to see that choice in education continued in our area by having Educate Together as a secondary school too. Our area has been deemed the highest growth area in Dublin; we have five autism classes across two of the four national schools, with a waiting list of 40 in Citywest Educate together National School alone. There are no plans or provision for our students with special needs to graduate to a secondary school locally either. Are they too to expect to be bussed to other communities for the next level of their education too? Why is the Dept of Education ignoring the needs of our youngest and most vulnerable members of society in the fastest growing area of the capital? A secondary school would also bring a much-needed focal point to our community – we have never had the joy of having a community centre. And we believe an Educate Together Secondary School will maintain the choice and diversity that our primary school afforded and achieved for our community, while furthering the sense of community for those often-left-out teenagers. I am writing to you to ask for you to consider doing a follow-up article on our campaign, with possibly a photo of our campaign group standing outside the area where there are plans for a secondary school to be built once given the go-ahead from the Dept Of Education. I could also send you a picture if it would be easier? In the face of inequality we’ve a long way to go balancing the scales nationally, but in the fastest growing area in the capital, wouldn’t it be right and fair to see an Educate Together model continue into secondary school education for our diverse and clued-in community? Citywest Educate Together Secondary School Campaign. We met with Minister Zappone in November 2016 to get her commitment to support our campaign for a second level school in Citywest. 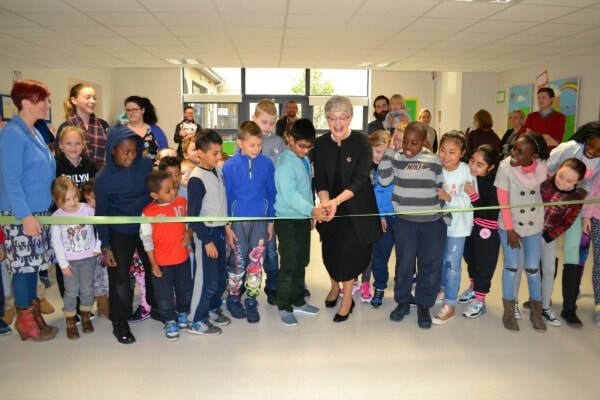 Minister Zappone met some of the children and collected art work & letters created by all the students of Citywest Educate Together National School, which she then passed on to her cabinet colleague, Minister for Education, Richard Bruton. 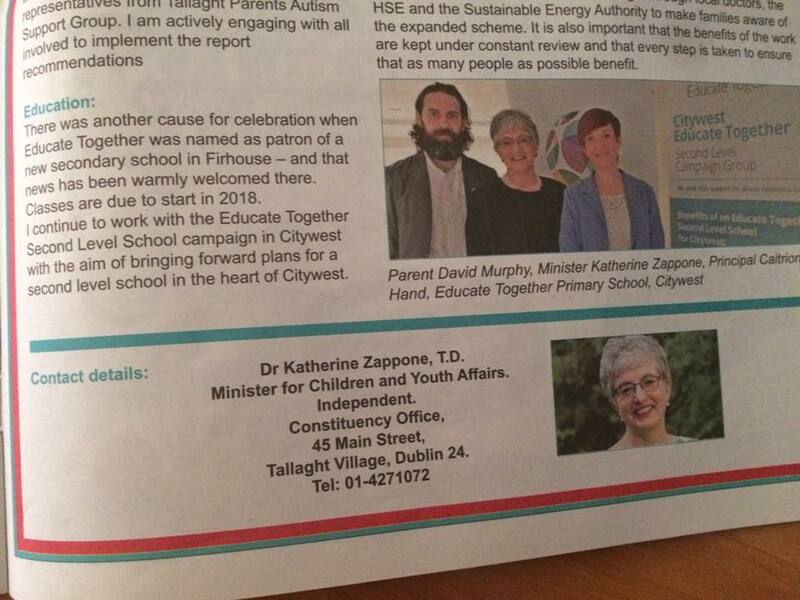 As you can see from the above print in the Tallaght Echo, Minister Zappone will "continue to work with Educate Together Second Level School campaign in Citywest with the aim of bringing forward plans for a second level school in the heart of Citywest". Following the commitment by Minister Zappone to our campaign we have continued throughout 2017 to work with her team to make progress to get the much needed second level school for Citywest. Check back on this page for updates on new meetings. Any support you can give to this campaign will really make a difference. Next meeting on Thursday 27th October 20:30 in Citywest Hotel Lobby/Bar to give an update on what has been happening since the summer and what the plans are for the future of the campaign. Please come along and get involved. Our children need a second level Educate Together here in Citywest. You can help make that happen. Our next meeting is on Thursday 16th June 2016, 8pm Citywest Hotel. We are building momentum and working very hard to secure an Educate Together Second Level School here in Citywest for all our children. We need everyone to support us. So please to fill out the expression of interest form (if you have not already). If you have, please help us spread the word for the dire need for a second level school in Citywest, so ask your neighbours, friends and relatives to fill out the form too. Just 2 minutes to fill out the form could help our children for years. Thank you all for your support and I look forward to seeing you on June 16th at 8pm in Citywest Hotel for our next meeting. Our next meeting is on Tuesday 24th May 2016, 8pm Citywest Hotel. Just a quick one to say a big "Thank You" for filling out the new letter to the Department of Education and for filling the expression of interest forms for Educate Together last week during our Second Level Campaign Awareness Days. The response during the days was super positive. Also, please check the Tallaght Echo this Thursday 19th May, as the Second Level Campaign will be in the newspaper. Thank you all for your support and I look forward to seeing you on May 24th for our next meeting. A Letter of Experience - We Need YOU! I am writing this about my experiences with our start up group for our wonderful school, Citywest Educate Together National School, in the hopes that it ignites your interest in our campaign to get a secondary school in our area. I have been a volunteer for Educate Together for the last 9 years. In 2007 we started out as 3 parents with a dream, who felt passionate about our shared goal- to achieve an Educate Together Primary School in Dublin 24. Our group grew in the next few years, but not without the hard work that comes with publicity, political lobbying, fundraising, writing letters, public meetings, and much more. We campaigned for nearly 5 years, and look where we are now! In 2012 our school opened to much anticipation and excitement. Nearly 4 years on and our school has grown exponentially to 210 students. So, what does this mean for our secondary campaign? Instead of 3 parents starting uphill, we've got a parent/ guardian body of potentially 420 helpers! A natural next step for all our children's education. All we need is YOU! A lot of traditional schools just seem to “pop up” as and when needed in an area. Sometimes too late for too many, as our own community is experiencing, sometimes, with luck, just on time for some. This is not the case for an Educate Together school, and indeed, never has been. They don't pop up out of nowhere. They are, for all intents and purposes, won by a start-up group of parents and guardians who often campaign and lobby for years for their ideal school for their children. And as we have all seen, a school who teaches equality, justice, child-centredness, democracy, and specifically- view students as individuals, with individual needs and hopes. A prime example of this is our own original start up group for our primary school. We lobbied and campaigned sometimes tirelessly when the political climate dictated so, for nearly 5 years. This, apparently is short compared to some other start up groups’ campaigns. But many of the parents who worked on our campaign from the beginning were unable to use the school which opened in 2012, due to the fact that it came too late for their children’s ages. Despite this cruel fact and devastating blow, they stayed on the campaign and worked on it until the end, volunteering their time and energy that still inspires me to this day. I have no doubt that we have our school because of these amazing people. A lot of people take for granted that, because they are very busy, then someone else will do it, someone else will campaign for a local secondary school, someone less busy. Or maybe it will just happen anyway? But I am here to tell you from my experience that great schools don’t come for free, not without people power, power in numbers, without political momentum and pressure, without community involvement and much publicity, without YOU! We need you! My experience in Educate Together volunteering is that I didn’t encompass one single parent or guardian who weren’t incredibly busy in their lives, with work, voluntary work, caregivers, studying, raising their children, double jobbing, or all of it! When I joined Educate Together 9 years ago I thought at the time that I’d no skills to offer the campaign other than ambition and hope. I had no computer skills, I was shy and lacking in confidence, I thought I’d no experience to offer the campaign. However I soon learned that not only was my contributions needed, but it was also valued and appreciated. See that’s what you’ll find in an Educate Together school campaign. Everyone’s contribution is appreciated, big or small, there is an understanding that each person is doing what they can do. And if you’re not there, the same old people are having to do more, even though most people have similar busy schedules, deadlines, pressures and stresses of everyday life. The old dictate remains very true- many hands make light work. I can’t overstate how every contribution made a difference, big or little, to the overall success of our primary school start up campaign. From marketing, fundraising, photocopying, letter writing, drawing, delivering, corporate sponsorships, politicking, publicity, cheering; it all made a difference. And the beauty of it is that it’s a grassroots movement made by ordinary people for their children’s education. In equal measure, that’s also its greatest challenge. We need our people, WE NEED YOU. Forget expensive toys and gadgets, what better gift to give to your children than your contribution to the betterment of their education? Another great challenge we face with our Secondary School campaign is that at the moment, just a couple of members are incurring all the costs of stationery, paper, website fees, and other communication costs. We will change this with fundraising supports. You know the old adage- a problem shared is a problem halved. You’ll find a co-op, not a clique, you’ll find a group of equal peers, not seniority, you’ll find always an appreciative welcome, never judgmentalness, you’ll find open minds to all kinds of ideas. You might even find, as I did, what a difference you can make. WE NEED YOU. Let’s dare to dream for an Educate Together Secondary School for our children too, and let's put those dreams into actions together. WE NEED YOU. You may be sensing a theme here… And at the risk of repeating myself, (is it too late to apologise?!) WE really NEED YOU! All of our primary school volunteer initiatives still need more of you too. ​Our next meeting is on Wednesday 27th April at 8pm in Citywest Hotel. Please come along, if you can. We have lots to do and so little time before our children head on to second level. We can not take for granted that a second level educate together school will just appear. We all need to come together and work for our children's future. I ask you please to spare any time you have to join the campaign and help us secure a second level educate together school for all our children here in Citywest. Educate Together is working towards a day when all children have access to a school that is truly inclusive and equality-based. For that to happen, Ireland needs many more Educate Together schools - schools that don’t demand proof of religion at the school gate and don’t segregate children along religious lines during the school day. Candidates must commit to establishing a national network of 300 Educate Together primary schools. Candidates must commit to developing a network of 30 Educate Together second-level schools. Candidates must commit to provide the necessary grants for the establishment of all new schools in Ireland. Candidates must commit to radically increase investment in our education system, to increase funding for schools and to provide proper supports for children with additional needs. Download the canvas cards with the 4 Commitments to show Election Candidates when they come knocking. ​Depending on where you are living, in either Dublin South West or Dublin Mid-West. We are lucky enough, just like the national school located in Citywest, that once open; our Educate Together Second Level School would attract families from both constituencies. Tell your local candidate that equality in education is an issue that needs to be addressed. The State funds the education system and the Government is accountable to you - the voter and the taxpayer. We have provided email contacts for all election candidates below, and a template for your email above.